We planted 45 varieties of seeds including alyssum, mixed beetroot, four types of broccoli, Brussells spouts, four types of cabbage, purple cauliflower, clauseme lansium aka wampi fruit tree, onion chives, endive, fennel, good king henry herb, kailaan, four types of kale, kohl rabi, leek, four types of lettuce, mizuna, mustard, 5 types of onions, parsley, poppy, silverbeet, spinach, three types of turnips, viola and our bush tucker Murnong Yam daisy. Our second seed saver meeting for 2018 was held on Saturday. We had 24 at Seed Savers including 3 Girl Guides from Winston Hills. One of our youth members, Susannah, brought along other Girl Guides to give service and learn about a community organisation. This was part of a badge she is working on. Susannah will also be going up another level and has agreed to earn about what our different plants provide for optimum health. Go Susannah! Nearly all the 50 varieties of seeds we planted last month had sprouted and grown extremely well thanks to some extra rain, and Genna fertilising mid-month with Joe’s fish poo fertilizer. Members took home seedlings for their own gardens. 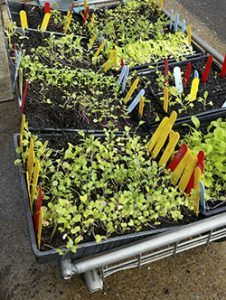 A tray of seedlings was taken to the blitz and the rest go to members and various schools and community gardens. We propagated 2 lavender varieties, rosemary, golden majoram and lemon verbena, all of which smell amazing. The other half of our morning was spent cleaning harvested seeds. We cleaned 26 varieties. 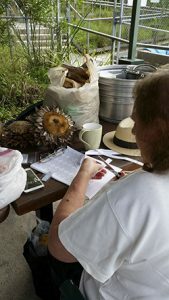 Members cut labels for the seed packets and measured seeds into the packets. The packets are designed to have enough seeds for a family of four for each growing season, not hundreds! We charge accordingly. This ensures seed is always fresh and viable for you. We also received seeds donated from members’ gardens to help build our seed bank. 16 varieties were sent home with members for direct planting: Alyssum, broad beans, carrots, coriander, onions, radish, snow peas, sweet peas, viola and murnong yam. 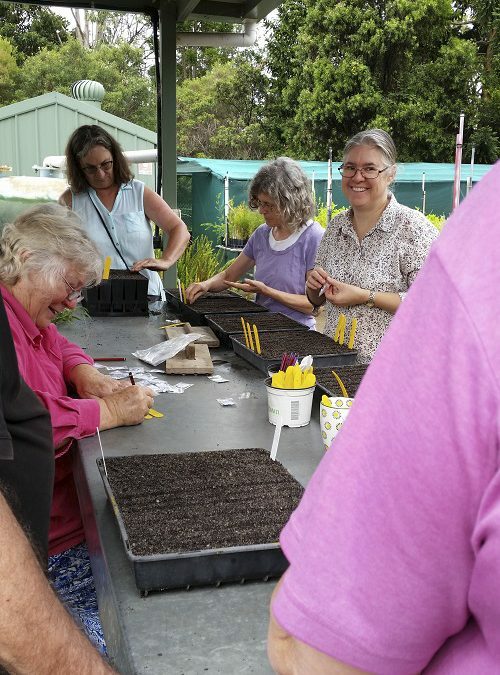 Seed Savers meets 9am-1pm on the 4th Saturday of each month at Bidjiwong Community Nursery, Baulkham Hills. All welcome, with free seedlings to take home each month. You are welcome to attend 1 meeting to see if this group suits you, if so you can become a single member for $25, or family member for $30 a year. Becoming a member is for the purpose of insurance cover and venue hire when you do any activities with us. Children from 8 years are welcome at Seed Savers.